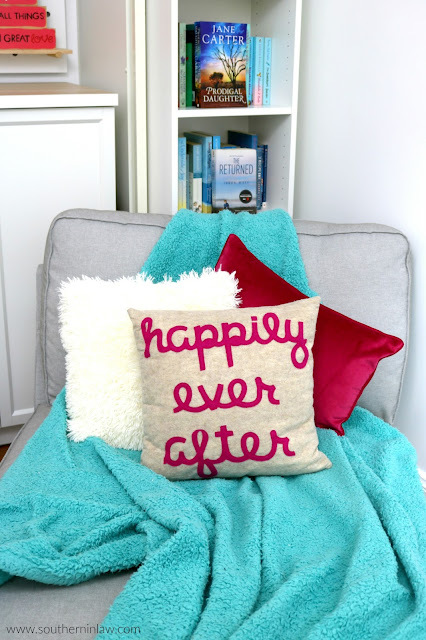 With a new month, comes a new decor theme - and I might have said this last month, but this theme may be my favourite! Whilst Jesse and I may not necessarily celebrate Valentine's Day, it was the perfect chance to change up my office decor with a pink, red and love filled theme! 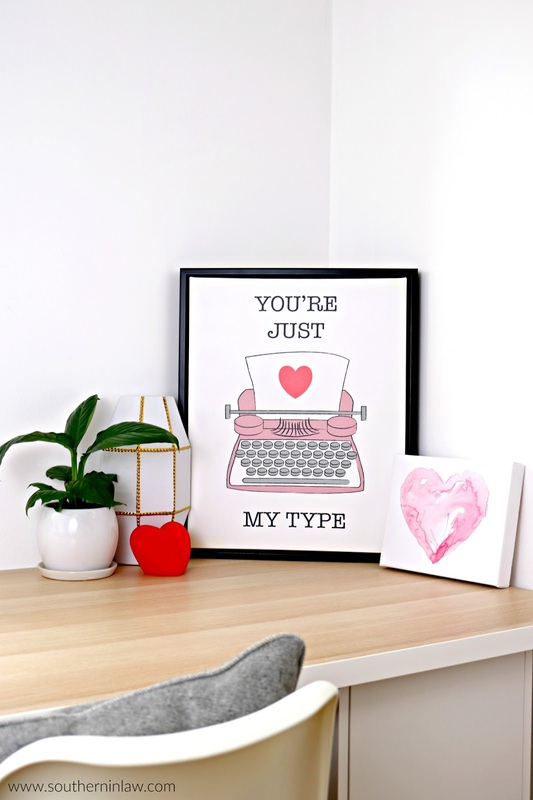 Every time I change around my decor I always have a favourite piece - and this month, it's this You're Just My Type Typewriter Print. 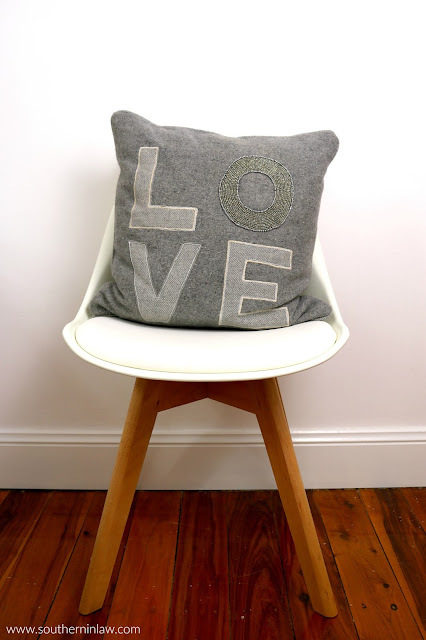 I managed to find it on the clearance rack at TK Maxx this weekend for just $8 and quickly put it in my trolley (yes, I mean business when shopping at TK Maxx - a trolley is a must) because I knew it would be perfect for the space. My second favourite thing has to this Happily Ever After pillow that my beautiful sister in law sent to us as a wedding gift! Five years later, we still use it all the time and love it! Originally I wanted a pink or red throw on the chair - but after not being able to find one that was bright enough or soft enough, I opted for teal instead. This rug from Bed Bath N Table is an old one - but so soft and cosy and one of my all time faves! This was clearance stock from Christmas - but that's one of my best bargain tips! 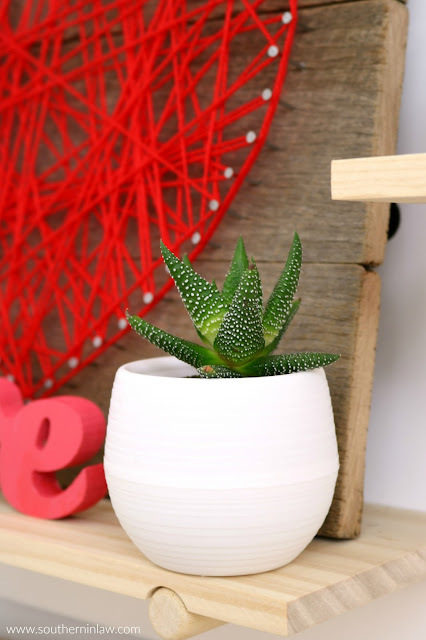 Often times, holiday decor can work year round - so head out on a bargain hunt either just before or just after the holidays to see what you can pick up. I also do this to find bits and pieces for future crafts. But what about my infamous Peg Board Wall?! 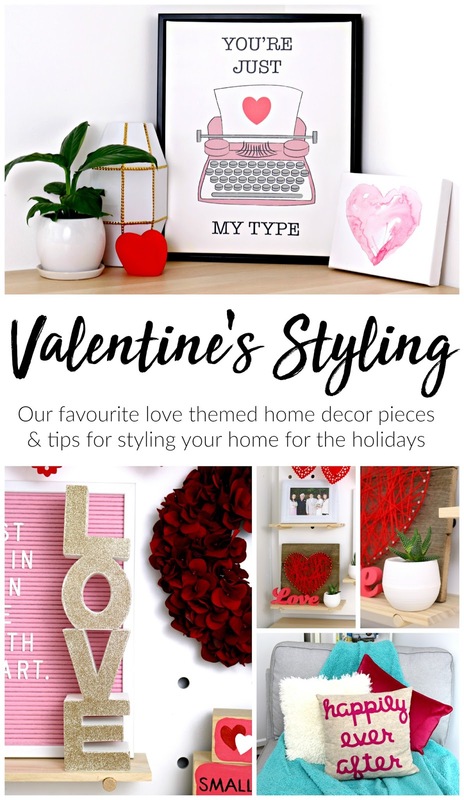 It's one of my favourite things to style and each month I'm always trying to come up with a new craft project to display. 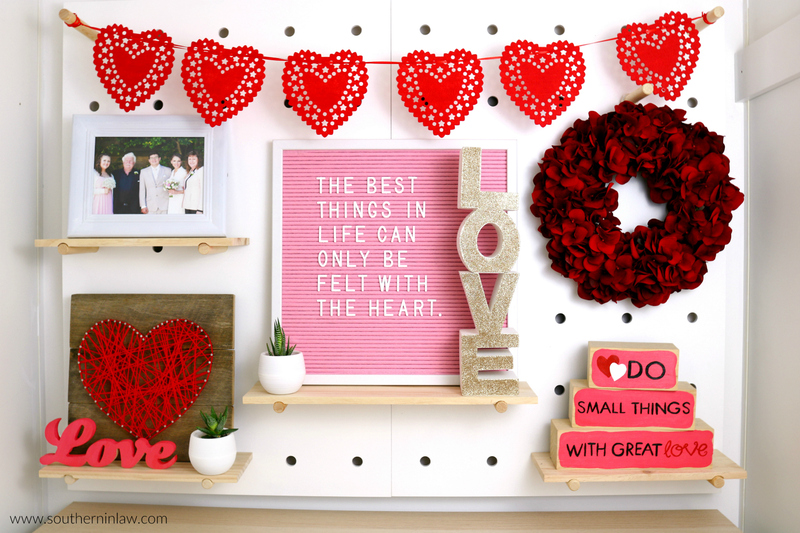 This month is was my Easy DIY Heart String Art - but I also have an old favourite craft project on their; my DIY Holiday Decor Blocks. 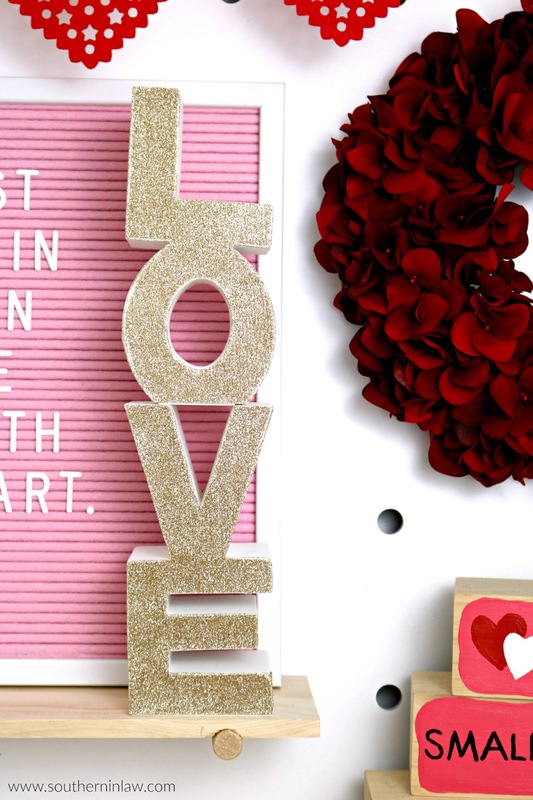 The Felt Letter Board was totally one of my favourite finds of the month - it's brand new at Kmart and only $8! The LOVE Letters are actually bookends that are supposed to go side by side (LO and VE) - but Jesse and I were staring at them for far too long and decided they looked odd - so they're balanced on top of each other. And that's a little peek at my surroundings for this month! Next month I think it's time for an Easter theme - complete with lots of pastels and cute bunnies. We'll see what I come up with! But in the meantime, I'll be sharing more photos over on Instagram - so be sure to follow me there @southerninlaw. And do you celebrate Valentine's Day? Any suggestions for future themes? Or recommendations for awesome home decor stores?